Improve your skills with these great Photoshop tips. Photoshop is an easy tool to use and a difficult one to master. Fortunately, help is at hand with our comprehensive list of tips, tricks and fixes for Adobe's showpiece software. Whether you're looking for tips on using layers, advice on mastering the pen tool, a guide to using RAW, or ways to improve your brush work, it's all here. Most of these tips were originally published in Practical Photoshop magazine – now part of Digital Camera World. If you're a photographer, we recommend making DCW a rest stop on your travels around the web. 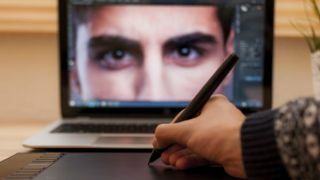 Here are the best Photoshop tips, whether you're using an older CS version or the very latest Creative Cloud software. We've grouped them by category to make it easier for you to find the stuff that's the most relevant to your work right now, but be sure to check them all! Shift + or – will cycle through different layer Blend Modes, so long as you don't have a tool that uses Blend Mode options settings. You can make amazing kaleidoscopic patterns with the help of a keyboard shortcut. Cmd/Ctrl+Shift+Alt+T lets you duplicate a layer and repeat a transformation in one go. To demonstrate, we've made a narrow glowing shape by squeezing a lens flare effect, but you can use any shape, image or effect you like. First, make an initial rotation by pressing Cmd/Ctrl+T and turning slightly, then hit Enter to apply. Next, press Cmd/Ctrl+Shift+Alt+T repeatedly to create a pattern. There's a really easy way to overlay an image on top of text. Drop an image layer over a type layer then hold down Alt and click the line between the two layers in the Layers Panel to clip the image to the text. To close all of your documents at the same time, Shift-click any image window's close icon. For interactive zooming, hold Cmd/Ctrl+Space then drag right to zoom in, or left to zoom out. The zoom targets where your mouse icon is, so it's one of the quickest ways to navigate around an image.